I have a list of silly Halloween jokes. Since I teach ESL to adults, this list of Halloween jokes is not usually an integral part of any of my lessons. However, if we have time during our lesson, and if the moment seems right, I pull out the list. Q. Why shouldn't witches lose their tempers? A. Because they will fly off the handle. This allowed me to teach two new vocabulary words to most of my ESL students: (1) frost, and (2) frostbite. Humor is one of the more difficult things for English language learners to understand. So much of our humor is based on cultural references and wordplay. It's a great way to teach vocabulary and, also, for an ESL student to know that he or she is really making progress (at least in some areas). A couple of days ago, I wrote Lay, Lie, ESL and TV Shows. "DC" took the time to post a wonderful comment explaining the difference between "lay" and "lie." While this may be lost on me, I wanted to post it for my ESL readers, and others, so that it may be of assistance to you. Here 'tis. When is "lay" appropriate? It's correct to say a person lays a book on a table. But after he does that, then the book is *lying* on the table. Same with a dog. A dog could lay a book on the table. Then the book lies on the table. That bit about dogs laying and people lying is pure confusion. It's lie, lay, lain (reclining, whether you're a dog, person or book) and lay, laid, laid (placing something or someone -- whether it be a book, dog or person -- somewhere). 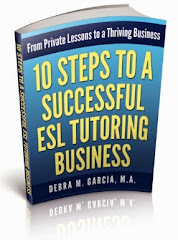 --DC"
I was helping to prepare one of my ESL students for the Cambridge Advanced English exam today. We were practicing for the speaking part. One of my American ethnocentricities came out when I commented about things being more safe in the world prior to 9/11. She reminded me of all the wars and other difficulties occurring in the world pre-9/11. She commented that she hears the idea that the world is now less safe from many Americans. One of the great things I get from working with ESL students from around the world is a reminder that even though I think my ideas are not "typically American," I am still a product of my culture and its influences. I was watching a rerun of "Cold Case" last night. One of the suspects in a murder was an ESL teacher. He taught adults. At the beginning of the episode, we saw the detectives interview the ESL teacher/suspect in his classroom. On the chalkboard was written "Dogs lay. People lie." The TV audience may or may not have caught this background scene. I did. Later in the episode, another suspect corrected himself in an interrogation when he said a sentence that included these words. This tipped off the detectives that there was a connection between this ESL speaker and the ESL teacher. As it turned out, both the ESL teacher and his student were accomplices to the murder. It was actually the ESL teacher who turned out to be the mastermind behind the murder, and ultimately the murderer. The ESL student was supposed to do the actual dirty work, but the teacher committed the murder before the student could get around to it. So it was interesting to me that there was actually an ESL teacher as one of the main characters in a TV drama. That doesn't happen too often. Actually, I don't remember it ever seeing it before. The other interesting thing to me was the use of "lay" and "lie." To this day, this is still one of those things that has not sunk into my head no matter how many times I teach it. I always have to review first before giving a lesson. Then I promptly forget the difference. I think this is the only part of the English language that has consistently given me problems. It's like I have a mental block for some reason. Oh well. One of the most common errors I hear my adult ESL students make is referring to small talk as "small talks," with an "s". Small talk never takes an "s" at the end. It's already a plural (compound) noun. This is probably the easiest thing that I can offer my ESL students about small talk. I can also offer some basic topics for small talk (weather, traffic, food, sports, etc.). For more advanced ESL learners, the topic can get a little more complicated. After English language learners master the simple small talk topics, they often want to go beyond the basics. I feel that this is often where cultural differences and even political correctness can come into play. Thanks to my previous lengthy work and life experiences, helping students to maneuver the topic of small talk through these more complex pathways is one of the things that I feel I'm able to offer my students. I've mentioned before that some of my advanced ESL students have asked me about making "small talk." Most want to learn about it so that they can use it at work, especially. Every now and then, I take it upon myself to bring up the issue to my students even if they haven't asked me about it. I always greet my students with the typical, "How are you?" Every now and then, I get a student who gives a very long answer. Well, as most Americans (and others) know, this question is really a form of greeting. The typical response should be something like, "Fine, thank you. And you?" This doesn't necessarily mean that Americans are insincere. It's just that the initial "How are you?" should be thought of more as a traditional greeting, rather then a real request for information, or even genuine concern. We may follow up with a more genuine question like, "How are you, really?" if we are closer to the person. If my ESL students aren't aware of this social skill, then they may turn off others when they are really trying to be polite and genuine. So I think it's a useful thing to teach. 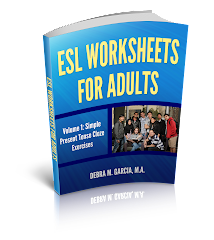 This is my 200th post to my blog about teaching ESL to adults. An average of over 250 visitors see my blog every day. I don't know if you actually read everything, but it's really great to know that some people are finding it useful. I've received a lot of great emails from ESL students and teachers alike. If you would like to have your own blog about ESL, EFL, or any other topic, you can always start your own blog for free. As I've written before, sometimes blogger isn't the best free "blog-ware" out there because of the "Next blog" option. You can also check out Wordpress to start a free blog. In any case, I'll continue to write about my experiences teaching ESL to adults. For more ESL grammar tips, you can see my regular website at Teaching ESL to Adults. I met with a new ESL student today to do a free Needs Assessment. I always offer a first free meeting to potential students. This gives me a chance to decide if I would like to work with the student and gives the student a chance to decide if he or she would like to work with me. The potential student I met today is a philosophy professor from Russia. He's a visiting scholar here in the States. I enjoyed talking to him a lot. I'm really fortunate to have a lot of students who are very interesting and with whom I can have interesting conversations. I look forward to working with this new ESL student. I read an email from a friend today. She started the email with "I was wondering if you made it to the show." I was a little confused by the email. I thought she hadn't read a previous email that said that I was at the show. I then thought about it awhile and realized she meant that in the past (the night of the show), she had been wondering if I was present at the show. It made me think about my ESL students and how such a phrase as "I was wondering if..." could be confusing. "I was wondering if" uses the Past Progressive tense. Yet, native English speakers often use this as an opening for a request. For example, "I was wondering if you could lend me $10." Another way this could be expressed is "Could you please lend me $10?" "I was wondering if..." is a way to "soften" a request. However, if a non-native English speaker hears this, he or she would be justified in thinking this is a past tense event. English is just a bit confusing. As a private ESL tutor of adults, I feel that it's part of my responsibility to my students to answer questions and offer suggestions related to culturally appropriate expressions and terminology. This includes "political correctness." These things aren't usually part of my formal lesson plans. I just address them when they come up. Politically correct expressions were part of one of my ESL lessons today with one of my advanced ESL students. We were specifically looking at the word "chick" when referring to girls and women. The first step here was to discuss what "politically correct" means and its abbreviation "P.C." We then talked about literal and slang definitions of the word "chick"; and we talked about the context in which my student heard this word being used. When I have a particularly advanced ESL student, I may spend some time going over the history or background of a particular term or expression or word. The trick here is to remember that most of my students want to improve their speaking skills, so I have to not do too much of the talking! As an ESL teacher, I'm always on the lookout for great ESL or EFL sites that I can use for lesson planning or to which I can refer my students. If you happen to run across any really great ESL/EFL sites, could you please forward them to me? You can use the "Comments" link below or the "contact me" link under the "ESL Website for Teachers" heading on the right side of this page. I'll be happy to post those sites on my blog and/or ESL website to let others know about the great ESL/EFL resources you send me. Thanks! I really appreciate it! And other teachers/students will too. One of the small things some ESL students ask about is the difference between "somebody" and "someone." Is there any difference? According to Swan , there is no significant difference between these two words. He says that "someone" is more common and "somebody" is a little more informal. This is one those differences that it's really difficult to teach ESL students. A native English speaker will usually have a better feel of which to use in a given situation. Someone speaking English as a Second Language may have more difficulty hearing or knowing which sounds a little better. The difference in the meaning between these two words is really minimal, but it serves as an example of how the advanced use of the English language has to come from experience and maybe even an internalization of the language. One of the easy conversation topics I use during my private ESL lessons with adults is my student's favorite movie or TV program. One student recently described her favorite movie to me. It was "The Shawshank Redemption." I haven't seen the movie in years, although I remember the setting and the main actors. I asked my ESL student if she remembered when the movie took place. She thought it was set in the 1940s or 1950s. I told her that it was significant that an African American man and a white guy would become friends at that time. She asked why. This topic opened the door for a conversation about "race relations" in the U.S. There's always something to talk about during ESL classes! It was interesting to me that my student was unaware of the history of segregation and legalized discrimination in the U.S.
Today is "Blog Action Day." Millions of bloggers all around the world are writing something about the environment today. The topic of the environment is something that has come up in many of my advanced ESL conversation topics with my students. It's often difficult to separate discussions about the environment with discussions about politics, so we usually take on both topics. Most of my conversations about the environment have been with my Chinese students. China has such a large population and is developing economically at a very quick pace that it is easy to find topics of conversation related to the environment. Most advanced ESL students are familiar with the term "global warming." (George, repeat after me, "global warming is real.") It's a useful term to make sure that ESL learners know because it is such a part of our world today. I'm often asked how I can teach beginner ESL students English if I can't speak their language. I tell them about TPR (Total Physical Response). This is a great method to teach beginner ESL students. TPR for teaching ESL involves the teacher using his or her body to teach English. A simple example would be walking into a classroom and saying "good morning," and using body language to let the ESL students know to also say "good morning." If I wanted to teach ESL students what "stand up" means, I would stand up and say stand up at the same time. In short, in TPR the ESL teacher uses his or her body and/or props and the target language at the same time. I had to show up for jury duty again today. I was in the pool of potential jurors; not actually selected to serve on the jury. The judge and lawyers agreed on twelve people before my name was called, so I have been excused. That means that I can now freely talk about everything I saw in the courtroom. It was a criminal trial. The defendant was a Vietnamese man in, perhaps, his 40s. He was a small and thin man, missing some teeth. He appeared to be poor. The suit jacket he wore was faded and ill-fitting. He wore headphones into which a certified interpreter said in Vietnamese all that was being said in the courtroom. The courtroom interpreters are certified persons. They generally have met high standards to gain certification. I don’t doubt that they do a good job. However, mistakes can be made. Just as people using only English, for example, may repeat something someone else has said and make a mistake in doing so. So it was very interesting to me that the rules applied in court with regard to interpretation are that the jurors are supposed to take what the interpreter says as the exact interpretation of the speaker. Even if the juror knows the language being interpreted into English and she or he hears something different being said by the interpreter than what was originally said in Vietnamese, the juror is supposed to ignore what she or he has heard from “the horse’s mouth” and is supposed to only listen to the interpreter. I assume that this is done because what the interpreter says is what gets written into the record. I guess it probably all works out O.K., but it still seems a bit strange to me. It seems that if the juror knows something was erroneously interpreted, that she or he should have a duty, in addition to a moral obligation, to report it to the judge. I've had a recent experience as a juror in a courtroom. I happen to live in an extremely diverse area of the U.S. People from all over the world make their homes here. And even though some ESL speakers may have even gone through college here, there is still some vocabulary, especially slang or idioms, that they may not know. Native English speakers are often not conscious about what vocabulary may be unfamiliar to ESL speakers. The judge in my courtroom gave a very long lecture (one hour) about the court procedures. When an ESL speaker was in the jury box being asked questions by the judge, she said that she was concerned that she may not be familiar with some terms. The judge told her that if she did not understand something, she should speak up. "This is no time to be a wallflower," he said. It stuck me that the word "wallflower" is not something commonly taught to English Language Learners. I wonder if the juror knew what the judge meant. I'm sure she got it from the context, but if I were the judge, I probably wouldn't have said "wallflower." Appropriate word choice not only depends on the situation or circumstances, but also on the age of the speaker. For example, it's a good idea to teach adult ESL students that "grown up," when used as a noun, is really appropriate only when talking to children, or when it is used by children, or when somehow being used in reference to children. The appropriate term for adults to use is "adult." It would be really strange to hear an adult talking to another adult, and referring to another adult or adults, and use be using the term "grown up." One of incidental things to teach ESL students about vocabulary, whether it is slang or idioms or individual words, is the appropriate use of the vocabulary. There are some English words or expressions that are appropriate among your close friends, but they may not be appropriate in the work place or in other situations. For example, circumstances "required" me to teach the expression, "I gotta take a leak" to one of my adult male students. I was sure to let him know that this is something that he should only use in very special circumstances. ESL teachers should always be on the lookout for appropriate, and especially inappropriate use of words by their students. ESL students certainly learn new vocabulary outside of the classroom, but they may not have someone to guide them in the appropriate use. I've had a lot of young adult ESL students in the past few years. Many have been working towards advanced degrees in business. I've had a good number of CPAs and aspiring CPAs and other business majors. I ask them about how they came to their career decisions. Most have very logical reasons, primarily around making money and creating a good life for their future families. I'm currently working with a PhD student. She's working on a PhD in business. She used to work as a CPA in Korea. Now she wants to become a professor. She's in her early 30s. She told me today about how she really did not like being a CPA. She didn't care for the business world, but she didn't really feel there were any alternatives. I think that for people from many countries outside of the U.S., there seems to be fewer options. I think that Americans are becoming more comfortable with non-money making alternatives for careers, and are desiring more to be "happy" in other ways. Maybe that will be one of our future exports. Currently, all of my ESL students are advanced and want to work on their speaking and conversation skills. We only occasionally need to review any grammar points. Mostly, we are focusing on accent reduction, pronunciation and general speaking skills. I hope that I don't forget all that I have learned about grammar and teaching English grammar! Are you thinking about becoming an ESL tutor or teacher? Do you know where to get started? Are you wondering what your options are? Where to teach? What kind of ESL positions are out there? Check out the Duties of an ESL Teacher to see if teaching ESL is something you want to pursue. Teaching ESL to adults has been one of the most rewarding careers I've had. Is it right for you? I met with a potential new ESL student the other day. He primarily wants to work on his speaking skills. He said he's tired of people in his office not being able to understand him. He's fluent in English. English was taught along with his native language in his country, so he's been speaking English since he was a kid. He also went to college and graduate school in the U.K. The main problem is his accent and pronunciation. But an interesting thing was his insight about not wanting to let go of his accent. He had some emotional attachment to it. He felt almost as if he'd be selling out if he sounded "more American." And yet, he wants to take private ESL lessons to help him with his English. This was just a reminder to me that learning to communicate effectively in English isn't only about English. There may be a lot of other things going on that can get in the way of improving one's English. The ESL's tutor or teacher's awareness of this may help him or her to be a better teacher.